The second part in Kyria's series of books for children , Rupert's Tales is absolutely wonderful. Readers may remember how much I enjoyed the first book in Rupert's travels, and won't be surprised at how I echo my joy once again. 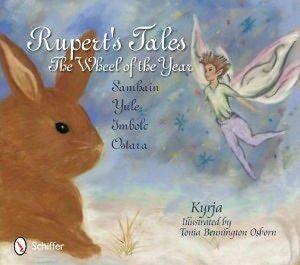 Kyrja's charming (rhyming) words are beautifully illustrated by Tonia Bennington Osborn's pastel drawings and the reader is delighted to join intrepid Rupert as he learns more about the wheel of the year. There are four tales, each about Rupert learning about love and tolerance and how to laugh. Along the way we learn more about the customs, decorations, and symbols of each holiday. Kids will enjoy the stories, although you will probably only read one at a time to very young children, and they will grow into some of the deeper nuances. Adults will enjoy them too, although they may find some of the rhymes tumbling through their head long after they story was read. Heck, I'd give these books to someone interested in knowing more about pagan rituals, but daunted by reading books with 'witch' in the title. See also our review of the accompanying Activity Book!